After you have found the opportunity you want to apply for and checked that you meet the eligibility criteria, you can create a new application. Note: If you are applying jointly with another individual/group/organisation you will be able to invite others to join your application later. 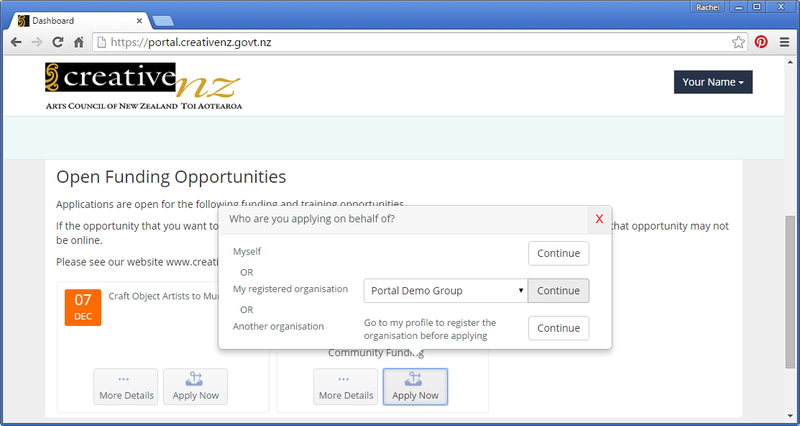 If you are helping to prepare an application for someone else you should do so using your own portal account. Contact Creative New Zealand prior to submitting the application to change the primary applicant. You will be taken to the 'Start' tab of your application. Read the information on this tab carefully, including the Further Information section. Complete the Application Checklist and click 'Save' before moving on to the other tabs. Next select the 'Applicant Details' tab. Note: The contact details on this tab are read only. Go to My Profile if you need to update any of these details. The tabs you see in your application form will vary depending on the type of opportunity you are applying for. You need to complete the required information on all tabs before you can submit your application. Check by clicking 'Validate' to highlight any required information that still needs to be completed. Some text fields have character limits. Click 'Save' regularly to make sure you don't lose any work.